Some fans of the Chevrolet Corvette eschew modern metal for classics like the C2 Corvette, while another sector of the fan base just can’t seem to get enough of the new Corvette Stingray. But could it be possible to please both camps? 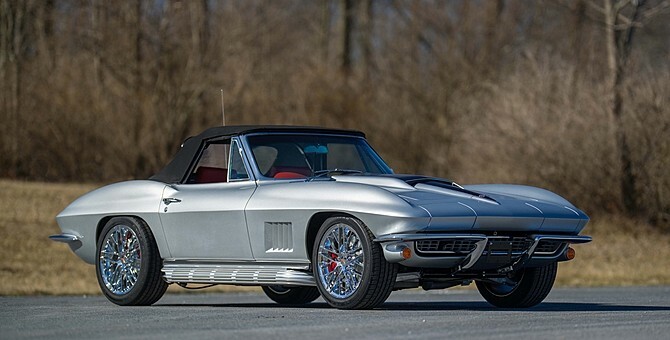 This special silver/black top 1967 Corvette Convertible just might be the answer. It offers up the classic style of the last-model-year C2 but under its black-accented stinger hood blister sits something special– a new 460 hp 6.2L LT1 V8 from a 2015 Corvette Stingray. Finished earlier this year by Bill Kuhn of His Place, Inc. in Emmitsburg, Maryland, this restomod now avoids the typical nose-heavy problems associated with the 427 big-block that might normally sit under the hood. It’s all hooked up to a Tremec five-speed manual with hydraulic clutch and 3.73:1 final gear ratio, while the whole car sits on a tubular chassis with complete C4 Corvette suspension. Meanwhile, big, four-wheel disc brakes (13-inch front and 12-inch rear) help keep this Stingray on dry land. No 1967 Corvette would be complete without the obligatory set of side pipes and this restomod doesn’t disappoint. You also get a red leather interior, gorgeous 18-inch grand sport wheels, a Flaming River tilt column with electric steering and a Dewitt aluminum radiator, while a few modern amenities like an AM/FM stereo with Bluetooth and an electric air conditioner help round out the package. Of course, this much awesome doesn’t come cheap and Mecum estimates you’ll need to cough up $175,000 – $200,000 to take this restomod home. Interested? Head over to Mecum’s Indianapolis sale on Saturday, May 16th and put your paddle game to work for Lot #S159. It seems a bit pricey. I think I’ll just buy a 2015 stingray and save a few bucks. And spend the Money I saved on a garage to park it in with a house attached to it.